I have been wanting to create this piece since I first started quilting. As soon as I heard that the theme for June/July was ‘memories’ I knew it was time. In June 1997 my younger son Kynan was born. In July 1999 he died in a tragic accident. I have tried to show that grief does fade but the memory stays forever. Two nights after the accident I couldn’t sleep and sat down and wrote the words that surround his picture. 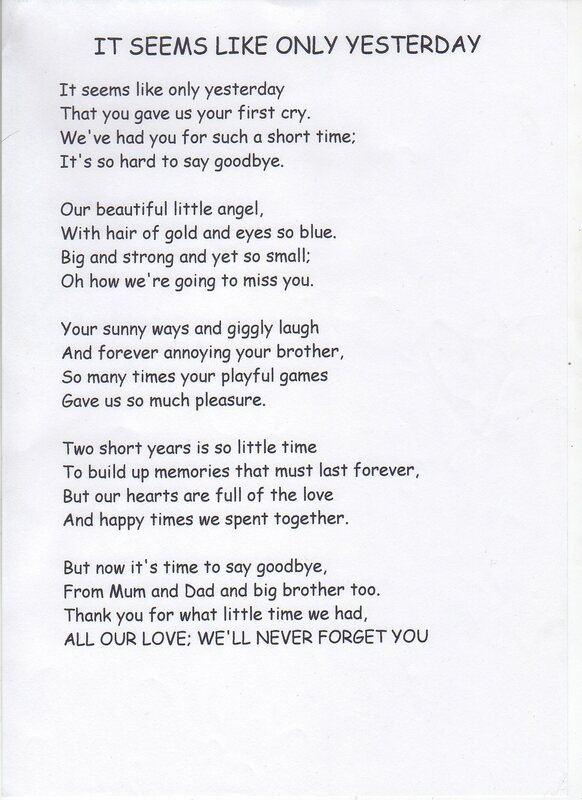 A simple poem to my son. It is a wholecloth quilt on basic high quality white poplin that I use for dyeing. The colour choice took a long time but eventually I knew it had to be a simple, slightly faded graphic look. Hence the grey rather than a stronger black and white. The picture is a photograph that has been manipulated using Photoshop Elements 11 and then printed using Laura Kemshall’s freezer paper technique onto poplin pre-treated with bubbleset. Free motion quilting using fine grey silk outlines the picture and the words are stitched with trilobal polyester thread. An additional layer of wool batting behind the print has produced the 3D trapunto. At the moment I have left the rest of the piece unstitched. I feel I need to live with it for a while before I finally decide if it is actually finished or whether it needs more stitching. It is edged with a simple very thin grey mottled binding. Gaye—-This is such a poignant piece. To me, there is more than enough stitching—the work in stitching the poem is incredible. You really put your heart and soul into this piece. What a sweet and tender piece. I’ve had many losses in my life, but never the loss of a child. There are no words; God bless and keep you — and your memories — safe, loving and warm. 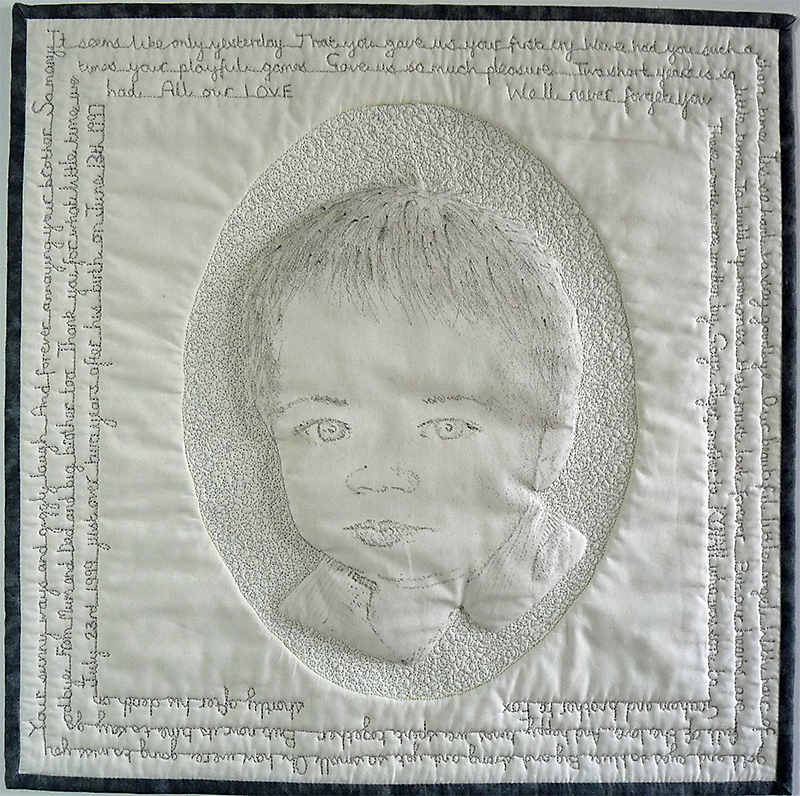 Gaye this wonderful little quilt gives me goose bumps. It is so sad and emotional and on the other hand so solemn and beautiful.. You really touched my heart with it. Dear Gaye, your quilt is so beautiful, and beautiful is what is behind. Can I tell you that at first I couldn’t read your comment without crying … like Margaret I’ve had many losses but but not a child. Your piece is so sad, but with this beautiful poem it shines.